This past Saturday we enjoyed an afternoon of walking through all the displays and home decorative and design options presented at the National Home Show. Unlike our visits to Home Shows in the past, this one involved constant searches for places to rest. In other words, where there was a chair, I was there. However, my faulty knees turned out to be very helpful; they gave me an opportunity to be Goldilocks on the hunt for the most comfy place to rest my weary bones. AND this was just right! Of all the chairs we (my son and I) parked our buns in, the Swinging Egg Chair, in our opinion, was absolutely the most comfortable chair ever! It wasn't just my son and I who were in awe at how comfortable these chairs were, it was everyone sitting in them in the booth! The seller had about 5 or six of them on display and they were being tried by passers-by on a constant basis. I found myself chatting with the testers of two other chairs on each side of me, and we agreed we could sit here all day and never get up. I couldn't put my finger on what made these chairs so comfortable. At first I thought it was the swinging, and of course, it was, but it was that and more. Perhaps the sense of floating? Maybe that was it? Whatever makes these work, I was thinking I could easily spend a day in one of these just reading a book and swinging to nice light background music. There are many other designs available in swinging chairs. In the display at The Home Show there were single chairs like the one above, just enough for one person. There were double swinging egg chairs for two, and there was a swinging lounge chair as well. I tried them all, and WOW, is all I can say! I really like the swinging double egg chair too as it would enable you to put your feet up if you wanted. These can also be used inside the home. In fact, depending on the manufacturer, you can find them in other colors. They'd be great in a bedroom, office or even a large family room. You would have to be sure there was enough space in the room, as the base is quite large, and the egg chair itself is a good size as well. 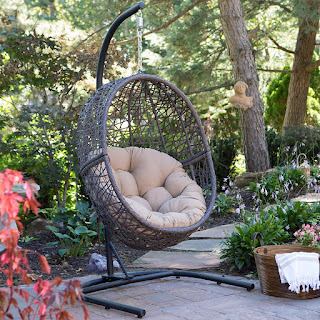 The measurement of the Swinging Egg Chair in the photo is 37.5 inches in diameter by 75 inches high. The chairs are also quite heavy and sturdy; this one weighs about 60 pounds. I have to say, if I find a place inside the home to include this comfy egg chair in my décor, I'm going to do it. I would love a swinging chair! Thanks for pointing me in the right direction with your review! After trying it Heather, me too! These swinging egg chairs look marvelous. I've tried the swinging chairs that hang from a hook on a front porch, but didn't know you could get ones on a stand for inside the house. Would love to have one and I know just the spot -- a sunny solarium at one end of my apartment living room. I can picture it now -- me, my swinging chair, and a new mystery book for an afternoon of heavenly relaxation! Pat, that would be a great spot for one. They are surprisingly sturdy as well for a free standing unit. Now, that is very interesting to learn! I have always thought the egg chairs were simply a funky design. It never occurred to me that they would also be a comfortable improvement. Did you have trouble getting up and out of the chair? I've always been afraid I wouldn't be able to get up without looking unladylike since there are no arms to lend support. Just looking at it makes me want to curl up inside the egg chair with a good book and take the day off. Cynthia, I had no trouble getting out of it at all, and my knees are not the best, so that actually surprised me. My first thought was if I get in, will I be able to get out lol - and I tried 4 different styles at the Home Show and was able to get out of each of them without a problem. I'm sure if someone had a more advanced disability than I do they could have trouble, but so far, I was OK to get in out. 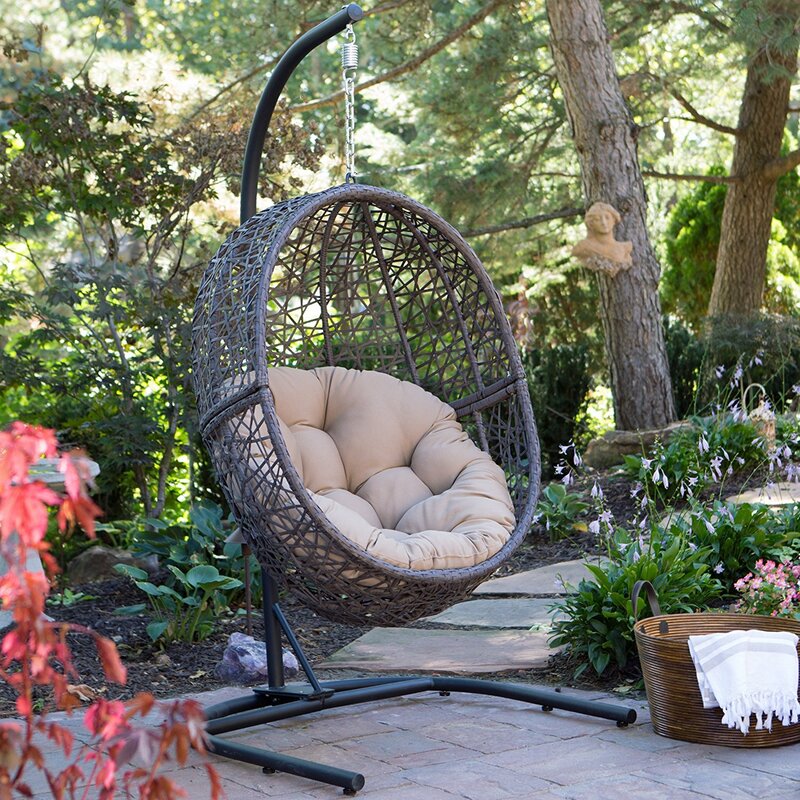 This swinging egg chair would be absolutely perfect on my porch! I like that it's on a very stable-looking stand. The cushion looks so very comfortable and you've convinced me that that is, indeed, the case. Love it! I have always wondered about these chairs... wondering if they were comfortable. Glad to hear they are. I've always liked the way they look but never thought they'd be at all comfortable. Dawn, looking at them you think, no way, can't be sturdy, can't be comfy - then you sit in it and are shocked to find out just how wrong you were - the chairs are surprising - I noticed in one of the Hospital Lotteries here, the grand prize (a fully decorated multi-million dollar home) had one of these chairs in the beautifully decorated rooms - now I know why! Comfy and funky! This sounds like a winner. If I move enough books, I may be able to make room for one. I take it the outdoor chair have a removable cushion so you can bring it in to protect it from weather and critters. I have to say that this looks intriguing. I'm going to the home show tomorrow so will check them out for sure. I wonder if they would fit on my balcony, seeing as how I'm moving to an apartment. This just might be my housewarming present to myself. 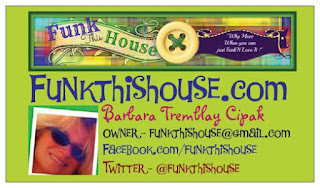 Thanks for the review Barbara! We've been testing these out for a while, but I know if I put one on our deck my daughter & I would be constantly jostling to sit in it and I don't really have room out there for two! When we renovate the downstairs porch I think we'll pop a couple on it and make it our outdoor reading area!